Apparently musicians who spend too much time playing their instruments get something similar to carpal tunnel syndrome, which can put them out of business for months. It happened to John Ely and he knows how to tell a good story, so I'll put him on the line and you can hear it straight from him. "Shortly after my move to Maui in 1995, I was forced to quit playing due to a repetitive stress injury to my left shoulder, the result of bad posture, a general lack of physical conditioning, and years of playing incorrectly. Down and seriously out, I had the good fortune to connect with Sherry Gannaway, a brilliant trainer from Honolulu (many thanks to Owana Salazar for the referral). Sherry worked with me over a four-year period and gave me the tools to bring myself back inch by inch. Her ideas were tailor-made for steel guitar. I could go on and on about her healing techniques, but I would rather share a few simple ideas that may prevent you from needing a Sherry Gannaway! "Good posture performs two vital functions. Firstly, it helps maintain the integrity of the spine, which helps the nervous system supply power to the major muscle groups. Secondly, it allows the entire body to absorb and distribute the motions of muscle groups that tend to get overused. For example, the safest, most efficient way to play steel guitar is from the standing position. Sitting puts stress on the lower back and spine, and limits the ability of the body to absorb the motions of the upper body. Players who sit at the steel guitar should counteract this tendency by strengthening the middle and upper body, especially the abs. Players standing should bend the knees slightly. Do NOT lock the legs in the fully-straightened position; this promotes bad alignment of the spine and prevents the legs from acting as absorbers. "Another example is neck posture. When looking at the fretboard, many players bend only at the neck. This creates a lot of stress and shuts off power to the shoulder muscles, making this area vulnerable to injury. It is much better to bend forward from the waist, bending from the neck only as needed. This position, however, will not feel comfortable until the abs, quads, and hamstrings have been trained. "In general, a well-developed midsection will prevent injuries to our extremities. Strong abs promote spinal health, and a strong upper body helps support areas further away from our center. If any region fails to receive the power or support it needs, it will have a tendency to overwork and weaken, and any area IT supports will be likewise affected. This is why training the midsection is crucial; dysfunction has a "cascading" effect. "Improper vibrato technique was the problem that finally pushed me over the edge. My shoulders were tense and "hunched." Notice from the photo how the "vibrato shoulder" is drooping, a sign of a generally weakened left side. The shoulders should be relaxed with the arms hanging freely. In addition, my vibrato motion came largely from my elbows and shoulders. Mistake! The wrists should play a big part in moving the bar. Really, the entire wrist-elbow-shoulder system should work in concert to take the pressure off any single area. "Begin training the legs and midsection slowly and under the supervision of a qualified trainer. Add light weights as necessary to tone the shoulder, biceps, triceps, and rotator cuff - as always, under supervision." "Gradually learn to play by bending at the waist, not so much from the neck." "Take a few lessons from a pro (Jerry, where were you back in 1973 when I needed you?!) and make sure that you are playing in a relaxed manner with efficient picking and vibrato motions." Now it's me [Lorene] talking again. When I got the severe pain in the shoulder and my doctor said I had a frozen shoulder (from computer key punching as well as from steel guitar playing), I remember hearing about John's frozen shoulder and how he had to quit playing the Old Lahaina Lu`au show in Maui. As for me - well I suffer so nobly, so what's there to say? I had to learn to write short letters. Some good advice I picked up from my physiotherapist is - don't hold the same position for too many minutes. At the end of playing a song, lower your hands to your sides and rotate your wrists. Change your whole body position between songs, such as stepping back and forward again, swaying from one side to another, lowering your head, and stretching your shoulder muscles. And like John said, keep fit. Get out and smell the roses. Don't wait until the shoulder freezes - make changes NOW. John Ely is one of the best Hawaiian steel guitar players I've ever heard and one super nice guy besides. 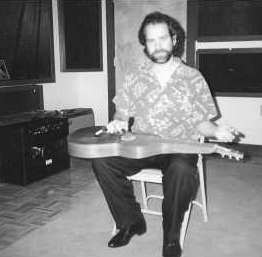 He played for many years as the steel guitarist for the Asleep at the Wheel Band, then went with Leon Redbone before moving to Hawai`i where he now plays a full schedule at Waikiki hotels. He was in a movie (as a steel player) starring Dolly Parton and has a snapshot of himself dancing with her. I'd have included it with this article but he sleeps with it under his pillow - so they say.